This is just a hobby. Therefore any aspect of this station is subject to my whims and likely to be frequently changing. 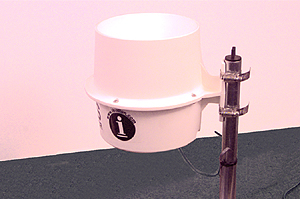 The station is built around a 1-wire Weather Instrument Kit manufactured by AAG. Their design is based on an original design by Dallas Semiconductor using 1-wire technology. The AAG Weather Station hub is located on top of the roof of my house, clear of nearby obstacles. It is however over a hot shingled roof. The enclosed temperature sensor reads a couple of degrees high in full sun. I have added two additional temperature sensors. One is indoors in the basement. The other is outdoors in a homemade pagoda. The pagoda is about 6 feet above ground and shaded during much of the day. Hopefully its readings are a more accurate indication of outdoor temperature. 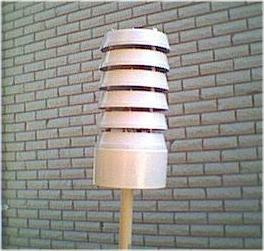 The newest additions are a rain gauge (see below) and an outdoor humidity sensor. In the future additional sensors may be added. The software I'm using for reading the sensors and displaying the information is WServer by Arne Henriksen. The rain gauge is of the tipping bucket style. The principle is that rainfall is directed to a "bucket" which is divided into two halves. The bucket can pivot similar to a seesaw. Only one half can fill at a time. When a calibrated amount of water flows into the upper half the bucket tips, that half empties and the next half is available to accept water. 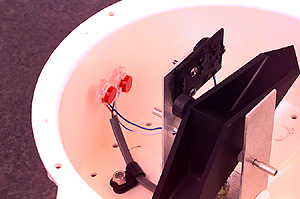 A magnet mounted on the bucket pulses a reed switch each time it tips and since the amount of water producing a tip is known (4.73 ml/tip = .01 inch of rainfall), the rainfall can be calculated.